Achieving balance in life is a challenge. But you can with this K-Cup pack! 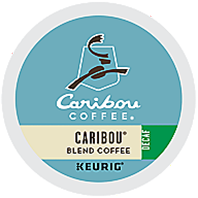 Caribou Coffee's signature blend meets that challenge, balancing a big-bodied, syrupy taste with a clean, snappy finish. The secret of this blend's relaxed complexity is a rich hearty Indonesian bean, perfectly proportioned with Central American and South American varieties for lively fruit tones. The result is a coffee with universal appeal, delightful any time of the day or night.